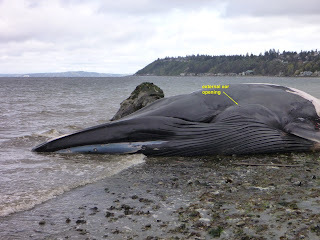 At 9:40 am on April 13, 2013 an adult Fin Whale washed ashore at Seahurst Park Beach south of Seattle. The whale was estimated to be about 65 ft. in length but the tail and most of the body aft of the head was missing. Researchers believe the whale died when struck by a ship. Ship strikes on large whales appear to have become more common in the last decade. 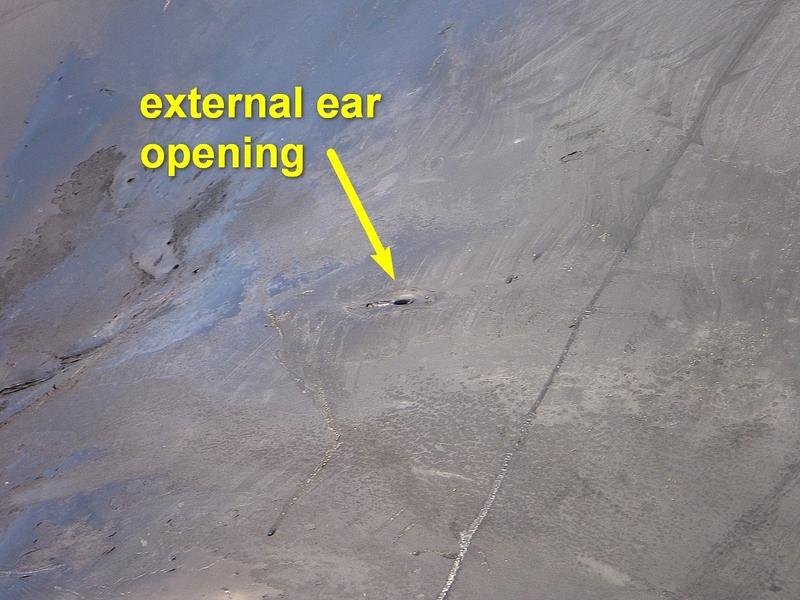 Since 2002 10 Fin Whales have stranded in Washington State and 8 have been ship strike victims. How many whales were ship strike victims and not recovered is unknown but the number is likely greater than the recovered number. They are a world wide species with a world population estimated at 100,000 and a West Coast of the US population of about 3,500 maximum. 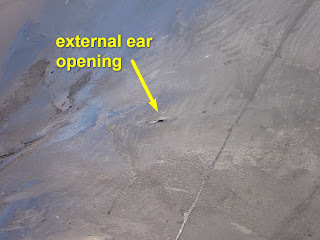 Fin Whales may live to 80 years and age can be estimated by counting layers built up on waxy ear plugs. Fin Whales are baleen whales that filter krill and small crustaceans and to a lesser degree small fish from the water. The baleen consists of hundreds of flat fringed plates that hang from the upper jaw. The inside edge of the plate is divided into fine hairs that form a filtering mat of hair inside the whale's mouth. Food taken into the mouth in large gulps is trapped on the baleen while the water is ejected from the mouth between the plates. Fin Whales are the second largest whale bested only in size by the Blue Whale to which they are closely related. Fin Whales have an interesting color pattern on the lower jaws and baleen. Baleen plates on the left side of the head are all the same uniform dark color (lighter in the center of the plate) while the most forward 1/4 of the baleen plates on the right side are cream color as is the lower jaw on the right side. The lower jaw on the left side is uniformly dark. When the whale feeds it gulps its food; the mouth can be expanded in size due to the presence of pleats on the underside of the jaw and some distance aft of the jaw. As water and food are gulped into the mouth it expands greatly even to the extent of giving the whale a tadpole like shape. Ejecting the water through the baleen plates is accomplished by contracting the expanded pleats to the original non feeding size. When Fin Whales have been observed gulp feeding they have been noted to roll on their right sides during the process. The white color on the right side likely has some role in the effectiveness of the feeding process. A new scientific find of an organ at the front of the jaws sheds some light on how these whale feed. The whale was removed from the beach 4-16-13 by a marine salvage company and will be allowed to naturally decompose on a undisclosed beach in south Puget Sound. The skeletal materials will go to an educational institution.